Life changes. Some things are out of our control in the midst of those changes. What we do have control over is who we are and what we choose to do in the midst of the changes of life. It is so freeing to know what is out of our control and what we do have control over. A couple writings from my days as a practicing Christian seem very relevant to this. I'm not a "throw the baby out with the bath water" kinda guy, and I still draw on a lot of wisdom from the deeper, spiritual aspects of Christianity. I hope that regardless of your worldview, you can find wisdom in it as well. An anxious heart seeks to control things that are beyond its control. I don't think this Psalm speaks about thinking lowly of ourselves, but of having a sober view of ourselves in relationship to the world and the universe around us, and acknowledging that there are many things beyond our control, that it is best to not worry about those things, but instead to focus on things that are not "beyond" us. And a key to this is having the attitude of a weaned child. If you've ever had children or have seen children who breastfeed, you know that they cannot sit on their mother's lap without being anxious and wanting to feed. But a weaned child will sit their contently because it is not anxious. In order for us to not be anxious about the things "beyond" us or "too difficult" for us, we need to trust that those things are taken care of. One of my carry-overs from my Christian days is that I do believe there is a benevolent power beyond me that has those things under control, and that gives me peace to take hold of the things that are within my control and let go of the things that aren't. For those that believe that the universe is entirely random, or even worse, malevolent, I can't offer this latter encouragement of the Wheel of Fortune card and can only say, there is no sense in striving to control the things beyond us, and coming to peace with whatever life brings us and making the best of it is surely a better approach. 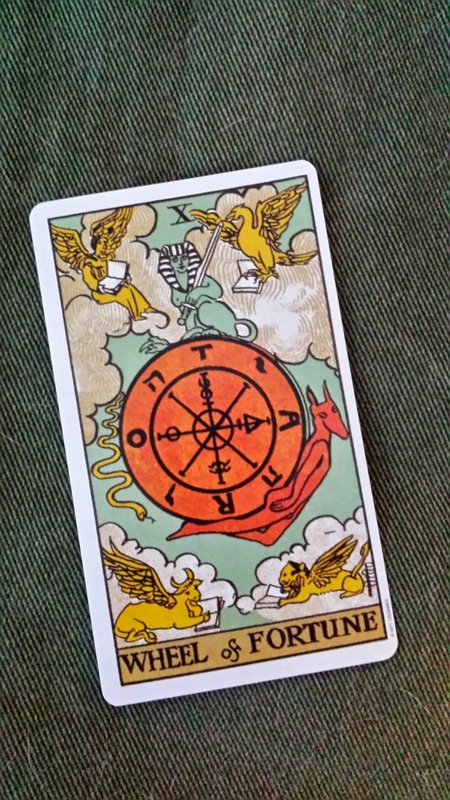 Regardless of where we seek our wisdom and our strength, the Wheel of Fortune card reminds us that life changes, and that we ought to be mindful of the differences between what we can control and what we can't, doing our best with the former and having peace with and letting go of the latter.